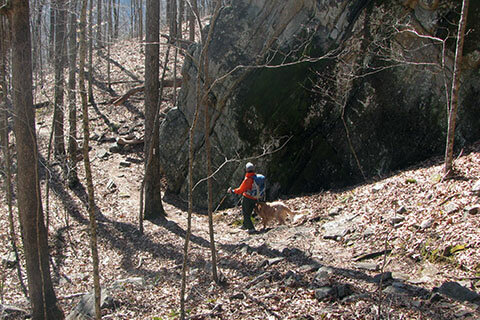 The Trail Guide to Stone Door, Big Creek Gulf, and Big Creek Rim Trails includes a trail description, photographs of the trails, comments from our hikes, mileage data, custom topo map. 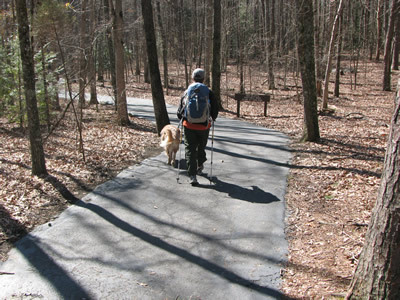 The guide will familiarize you with the Big Creek Trail system. We hope the guide helps you on your hikes and adventures. Other trails in the Park: Many! See link above. We plan on doing more of the great trails as time allows. Directions: From Interstate 24 take exit 127, TN Hwy 50 and go east toward Pelham. The exit is between Monteagle and Manchester. Leaving the Interstate, follow Hwy 50, 18 miles to Altamont. Turn left in Altamont on Hwy 56 and head north through Beersheba Springs. Turn right after 5.5 miles on Stone Door Road, just passed a road side park on the right. It is 1.5 miles to the parking area. 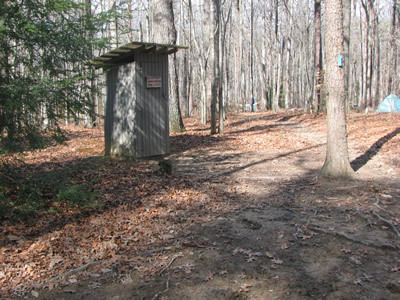 The trailhead has heated restrooms, a water fountain, a Ranger Station, and trail kiosk. Nearby there is picnicking and walk-in camping sites. All users are required register at the kiosk. Free permits are required for overnight camping. From the trailhead take the paved path toward Stone Door. That's right, the paved path. 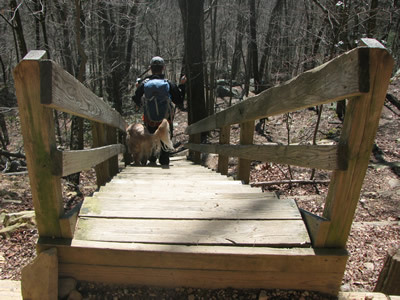 This special section of the path leads .25 miles to the Laurel Gulf Overlook and provides accessibility to all. As the sidewalk ends, the trail begins. Maintaining an easy grade, the trail continues .25 miles to a creek (this is the only one with water for most of the year, there are several drainages) and then another .40 miles to Stone Door. 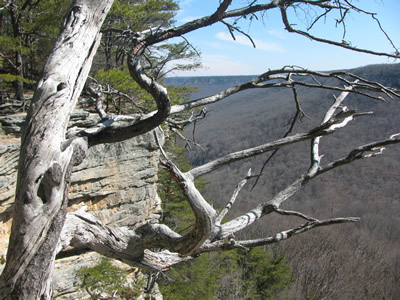 The overlook are at the top of a hundred foot cliff with vistas of Big Creek, seven hundred feet below. Descend the Door’s passage on rock steps between the walls. 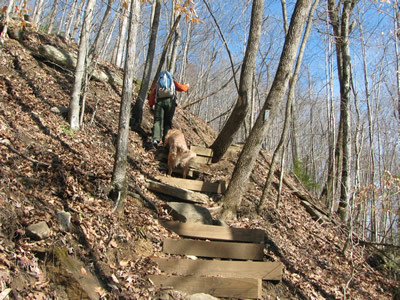 At the bottom of the rock stairs, a set of wooden steps leads down another small cliff. Continue down as the path draws close to a large boulder. Two white blazes means look for a trail directional change. 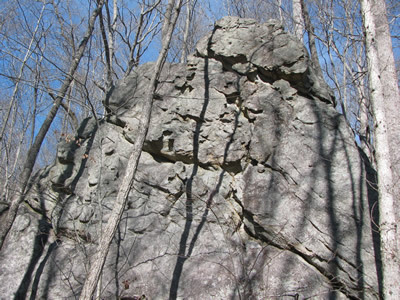 The trail turns sharply to the left, and crosses some large rocks at the top of a large rock slab. It is hard to see an actual path, look for blazes instead. 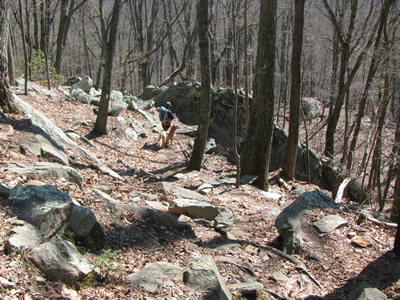 Once clear of the slab’s steep slopes, the trail goes down to the right. This is really the only section of the trail that is hard to follow. Cross under the slabs while descending in large sweeping switchbacks. 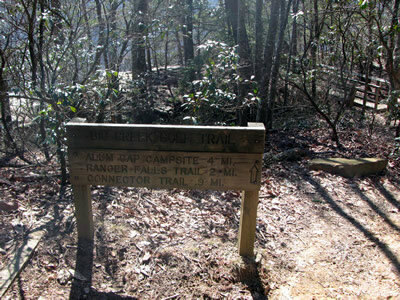 At .90 miles from the top of Stone Door, the trail junctions with the Connector Trail, which goes to the left. Going right on the Big Creek Trail, the creek is reached in .25 miles. For the next three miles the trail follows the creek and at times uses an old roadbed. 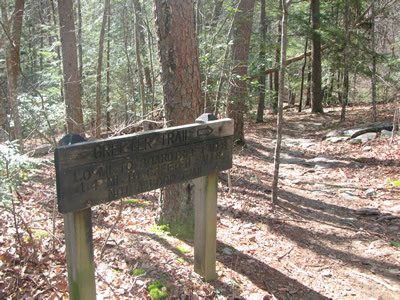 In 1.1 miles the trail reaches the Ranger Falls Trail Junction. The .40 miles (.80 round trip) side trip to the falls is well worth the effort. 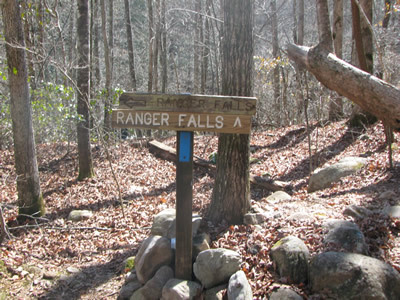 For Ranger Falls, turn left from the Big Creek Trail, follow a rocky bed, and look for blue blazes. 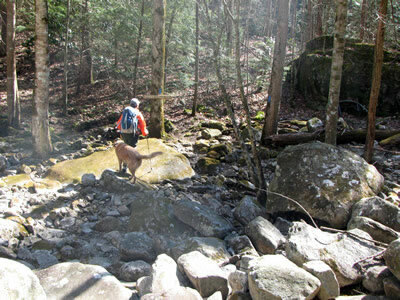 Cross Big Creek, stepping across on stones, and begin the easy climb toward the falls. 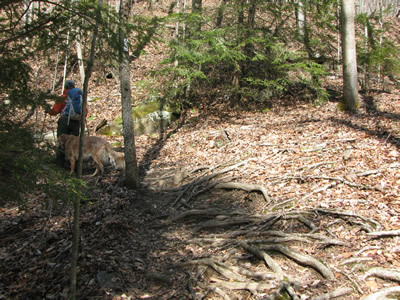 The trail climbs to the right of the dry creek bed and then crosses to the left. 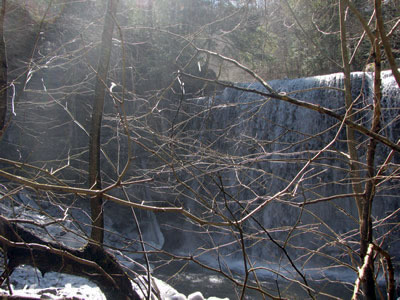 Ranger Falls are reached at .40 miles. 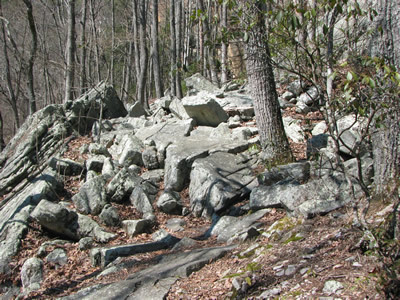 Back on the Big Creek Trail, the path climbs for 150 feet in elevation, winds through large rock formations, and then comes to a large bolder on the right (Big Rock) at .30 miles from the junction with Ranger Falls. The trail continues to follow the creek bed and after .60 miles the trail does another short climb of 100 feet in elevation and then levels. There are no more significant climbs until the last effort. It is reached in about a half of mile. The trail begin the ascent by going up steps made by a spidery root system. Steeper still, the trail then climbs wooden stairs to intersect an old road. The steep road climbs the gulf slopes to finally reach Alum Gap. 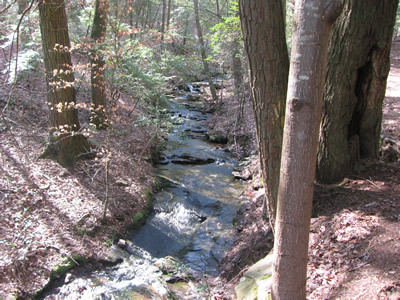 When nearing Alum Gap there is a wonderful cascading creek in the drainage to the left of the road. 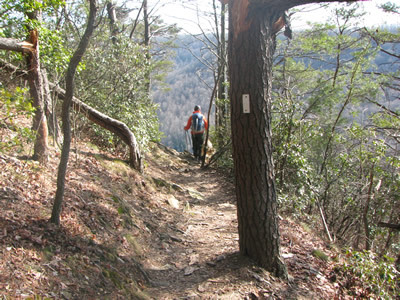 It is a 400 feet climb in .40 miles from Big Creek to Alum Gap and the junction with the Greeter Falls Trail. 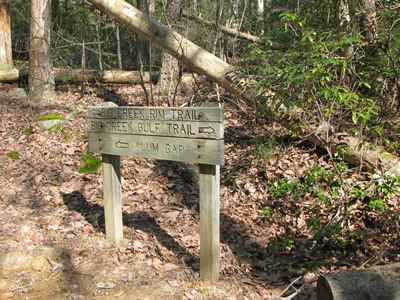 Once at Alum Gap there are signs for Greeter Falls, Laurel Trail, and Big Creek Rim Trail. 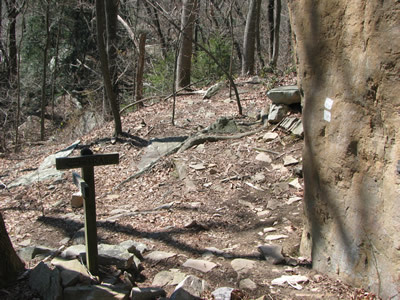 Follow the signs for Big Creek Rim Trail to return to Stone Door. From the Greeter Trail sign it is .10 miles to the Big Creek Rim sign and then a few hundred feet more to the outhouse and campsites. Camp in designated sites only. The Rangers check. 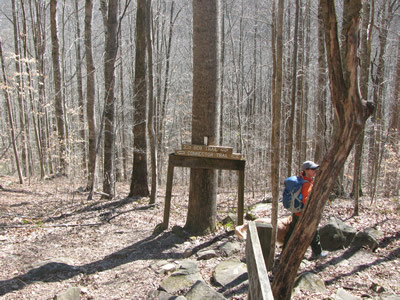 From the outhouse it is .50 miles to the first of several overlooks - Big Creek Overlook. 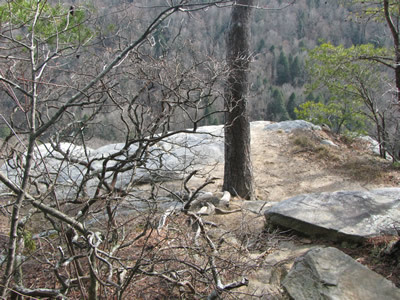 The trail traverses close to the cliff’s edge at all the overlooks. Special care should be exercised. 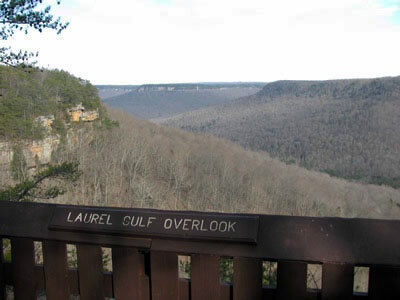 The second overlook, Pine Rock, is nearby. The trail contours around a drainage and returns for a second view of the gulf. From Pine Rock Overlook the trail follows the line of least elevation gain as it contours the drainage's crossing two creeks and arriving at the Sinks Overlook in 1.0 mile. Leaving Sinks Overlook the trail continues its contouring efforts as it crosses a creek in a few hundred feet and then comes to a want-to-be overlook after .50 miles. 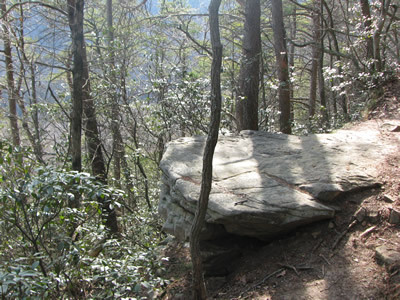 A rock sits primed to be an overlook, but the trees block the view. 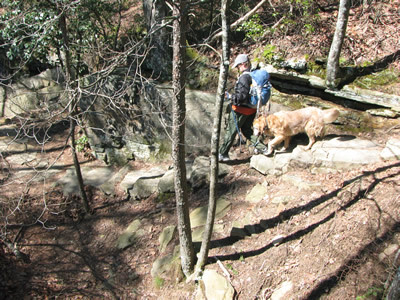 From the rock want-to-be, the trail contours back to another creek and then arrives at the last overlook in .75 miles. 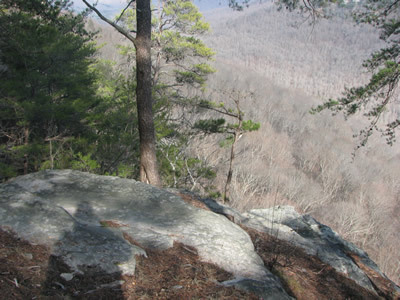 Split Rock Overlook gives views of the Big Creek Gulf again, but continuing a short distance on the trail views of the Stone Door cliffs come into view. It is .25 miles from this point to the junction with the Stone Door Trail. 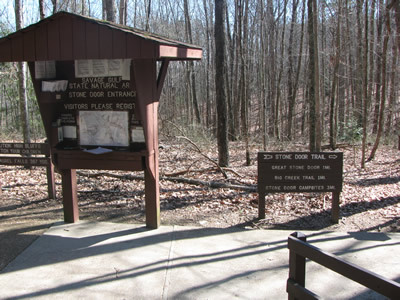 Turn left (unless you want a second look from the top of Stone Door) and return to the Stone Door Trailhead in .90 miles. We highly recommend the hike. Good scenery and trails, with a few good hills just to make it more interesting.